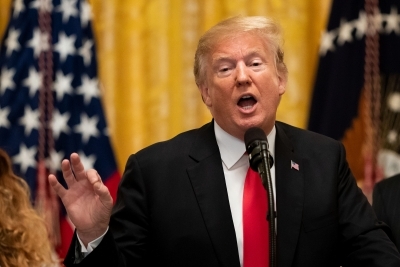 Washington Sep 14 (IANS) US President Donald Trump s administration has approved the sale of 64 missiles and six surveillance planes for an estimated cost of $2.6 billion the State Department has announced. "The proposed sale will support US foreign policy and national security objectives by enhancing Korea s naval capabilities to provide national defence and significantly contribute to coalition operations " CNN quoted the Department as saying on Thursday. If approved by Congress the sale of the P-8A patrol aircraft will provide an upgrade over the older US-made P-3 surveillance planes that South Korea has used for over 25 years. The P-8A is the newest maritime patrol and reconnaissance aircraft built by the US. Purchasing the Patriot Advanced Capability missiles will allow South Korea "to improve its missile defence capability defend its territorial integrity and deter threats to regional stability" the Department said. It will also "increase the defensive capabilities of the (South Korean) Military to guard against hostile aggression and shield the allies who train and operate within South Korea s borders". As part of the sale South Korea would also receive tactical radio navigation and early missile warning sensors for the aircraft. Thursday s announcement comes as the US and allies are days away from launching a new effort to "name and shame" North Korea by publicly exposing violations of sanctions aimed at curbing its nuclear and missile programmes defence officials told CNN. The new effort will make more public US and allied military efforts to enforce UN sanctions against North Korea particularly the monitoring of ships performing illicit transfers of refined petroleum to North Korean oil tankers in the East China Sea.